Since he was young, Sammy Chand had aspirations of a career in hip-hop and music production. But when he first started out, he faced resistance from both inside and outside his community, including racist comments that spurred the creation of his own music label, he told NBC News. “All the artists had songs — if it wasn’t directly to do with bullying — was still about self-empowerment and topics that us, as Asian Americans, have to grapple with when we’re living in America today." Chand is not the only one who has faced bullying at a young age. According to the Department of Justice, one in five students in 2013 reported being bullied while at school. It’s that statistic that convinced Chand to partner with the White House Initiative on Asian Americans and Pacific Islanders (WHIAAPI) to produce an album against bullying titled "#ActToChange" after the initiative’s anti-bullying campaign. “For a long time, bullying was treated as an unavoidable part of growing up, but more and more, we’re seeing how harmful it can be for our kids, especially when it follows them from their school to their phone, to their computer screen,” President Barack Obama says on the album’s opening track. 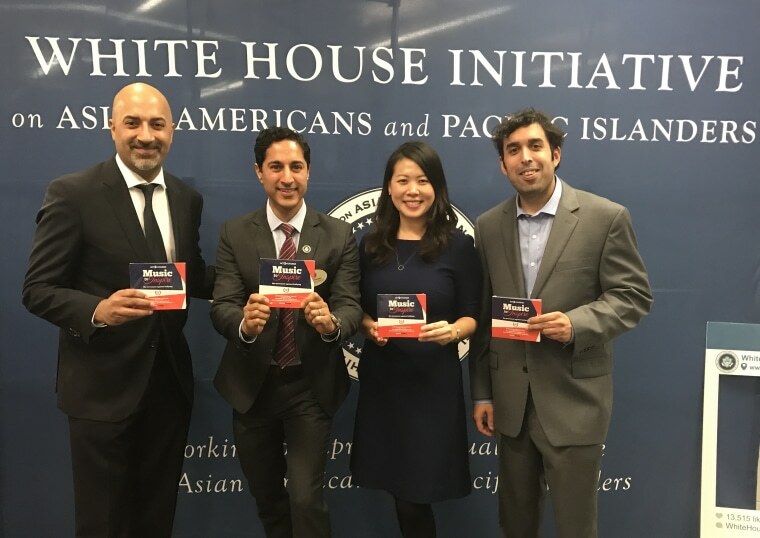 "#ActToChange" launched on Dec. 7 in conjunction with the Fast Forward 2060 exhibit and event, which took place in Washington D.C. and highlighted the Asian-American community under the Obama administration. It features 25 tracks of music and spoken word pieces from a compilation of artists and personalities, including Surgeon General Vivek Murthy, singer-songwriter Nadia Ali, folk band Run River North, actor George Takei, and Dia Frampton, among others. Chand said his involvement with WHIAAPI started last year, when he was invited to help organize and attend an Act to Change event in Los Angeles. In October, Chand said he had a conversation with actor Maulik Pancholy — a member of WHIAAPI’s president advisory commission — about producing a song titled “Act to Change” for the campaign. When Chand shared a rough cut of the song with Pancholy and Rebecca Lee — the communications director for the initiative — they wanted to take it a step further and create a full album. The album took just 30 days to produce, according to Chand. “All the artists had songs — if it wasn’t directly to do with bullying — was still about self-empowerment and topics that us, as Asian Americans, have to grapple with when we’re living in America today,” Chand continued. Celebrities who make an appearance include Pancholy, who speaks about how growing up, he struggled coming to terms with being gay; Takei, who recounts how people perceived him and his family after being imprisoned in a Japanese-American incarceration camp during World War II; and Brooklyn Nets point guard Jeremy Lin, who shares a story of when he was called a racial slur while playing college basketball. Chand said while the project was intended for the Act to Change movement and Fast Forward 2060, the album coming after the results of this year’s presidential election is a coincidence that makes its message even more powerful. Chand said that the three things he hopes to see accomplished with the album are for adults to realize that bullying is a problem and approach it in a more sensitive and compassionate way, for educational institutions to understand the kind of environment they should create for their students, and to ultimately change the power roles of the bully and the person being bullied.